How much has Coachella changed since its inaugural event in 1999? It has evolved so much in every way, but the way they've curated their live music lineup has remained pretty consistent—there's almost always something for everyone. Here, we'll take a look back at how the art and summer music festival has changed throughout the years. The inaugural year's lineup would send '90s kids into a serious frenzy with headliners like Beck and Morrissey. More importantly, Pavement was still together. There were also some notable small font acts here like A Perfect Circle and Spiritzualized. Back then, the view of the crowd had less phones up in the air and more bucket hats to combat the sweltering sun. Times were much simpler. 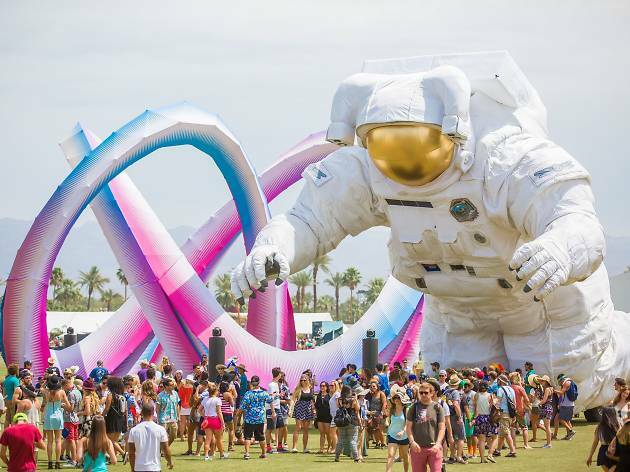 Coachella didn't happen in 2000 and instead returned for a smaller one-day event in 2001. Jane's Addiction headed the lineup that featured Fatboy Slim, Weezer, The Roots, Iggy Pop and Sigur Ros. The first time a woman headlined Coachella was 2002 when the Icelandic goddess Björk performed on the first day of what was then still a two-day affair. Oasis, another fan favorite that would make people go nuts if they were to headline today, headlined the second day. Other notable acts in this great lineup were The Strokes, The Chemical Brothers and Queens of the Stone Age. It's impressive to see Queens of the Stone Age climb up the lineup heirarchy after just one year. There are also some notable repeats here like the Red Hot Chili Peppers, Jack Johnson and Ben Harper and the Innocent Criminal. This year was loaded with fantastic acts like the Beastie Boys, Blur, The White Stripes, Iggy Pop and a two-day slot for Blue Man Group. Again, another lineup that would've sold out in seconds if it were announced for this year. Radiohead, who's also headlining this year, led the first day along with Pixies, Kraftwerk and Wilco. The Cure played on the second day with the Flaming Lips and Air. Wayne Coyne's famous giant bubble was still pretty new back then. Coldplay and Nine Inch Nails headlined in 2005 with an impressive lineup of bands at the peak of their careers. From Rilo Kiley to M83, then Arcade Fire to Diplo, it accommodated a diverse group of music fans. Art installations were simpler (but not less jarring) compared to the increasingly elaborate ones that the festival features now. Daft Punk's LED explosion of a Coachella performance is widely regarded as the best set at the festival... of all time. The band unveiled its epic pyramid show and EDM was never the same again. Oh, and Madonna was there too. Coachella expanded to three days in 2007. It's notable for being Amy Winehouse's first and only Coachella appearance. This year also paved the way for another female headliner, even if it's the same woman who did so years back. We're talking about the one and only Björk, of course. This year marked the return of the Red Hot Chili Peppers, Rage Against the Machine and Air, among other Coachella regulars. There were also some small font performers who would definitely be billed up higher now, like Andrew Bird, the Avett Brothers, and Grizzly Bear. Roger Waters performed Pink Floyd’s "Dark Side of the Moon." Jack Johnson got top billing—and Deadmau5 was way down at the bottom of the lineup, which definitely feels like it's almost a decade old. But it's also a great example of just how well Coachella curates their event; we could've attended this with our parents and everyone would've been satisfied. One of the best Coachella lineups is from 2009, which had almost everyone worth going out into the desert for. Friday's schedule was especially loaded with Paul McCartney, Morrissey, Leonard Cohen and Franz Ferdinand. Dhani Harrison's band thenewno2 also made an appearance. Deadmau5 made an epic climb to the top and Gorillaz headlined. Pavement also made a triumphant return to the desert during their brief reunion. Zooey Deschanel made an appearance performing with M. Ward as She & Him. This was a massive year for Coachella with a packed lineup featuring Kings of Leon, Arcade Fire, Kanye West, The Strokes, Robyn, Animal Collective, Interpol, Erykah Badu, PJ Harvey, Duran Duran and The National. Honestly, we could keep going. There were also plenty of awesome small font acts like Miguel, Francis and the Lights, Ellie Golding, Twin Shadow and Phantogram. 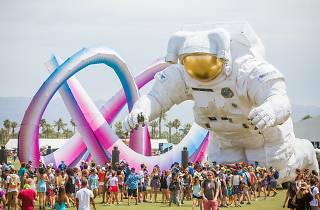 Coachella expanded into two weekends in 2012, marking the year the festival officially grew larger than life. Radiohead returned as headliner along with the Black Keys, Dr. Dre and Snoop Dogg. And, most notably, Tupac made a surprise appearance through a halogram. This year had a lot of other familiar names, like Beirut, Arctic Monkeys, M83, Andrew Bird and At The Drive-In. Cat Power and Feist were two of the highlights as well. A lot pressure comes with holding the same festival twice, so it's no surprise that the 2013 lineup was especially beefed up. Disclosure was still almost at the very bottom of the list, fresh from the UK success of their single "Latch" with Sam Smith. Now, they're probably big enough to headline. This was the year of the flower crowns, when the festival started attracting a much younger audience alongside many celebrities. We can still remember the intense excitement when OutKast announced a reunion performance headlining Coachella. It was one of the most anticipated shows of the year. Muse and Arcade Fire also made a comeback as headliners, along with Beck, Ellie Goulding and Queens of the Stone Age. Lana Del Rey debuted her single "West Coast" and Lorde made her first Coachella appearance. AC/DC played for the first time in six years at the 2015 installment of Coachella, headlining alongside Jack White and Drake. There was the much-discussed kiss that happened between Drake and Madonna, as well as the endless debate about whether the rapper was the worst headliner in Coachella history. We'll leave that up to you to decide. Two major reunions happened at Coachella when LCD Soundsystem and Guns N' Roses made much-hyped appearances as the Friday and Saturday headliners respectively. Calvin Harris took over Sunday, marking the peak of the producer's career. Still need to pack for this year's Coachella? Where to buy festival clothing in L.A. The styles change every year, so be up to date on what to wear to this year's festival.